You guys! Harvest squash pasta sauce might be all we eat for the rest of the month. The freaking best homemade harvest pasta sauce, right here. I want to eat straight out of the pot. Drink it with a straw. Spoon it over everything! I almost saved this recipe for a little later in October because, I mean, it’s SUPER fall-like. But then I realized that if we can all make it now, we can eat it for months! Like all the fall and winter months. Forever. Plus, when I’m insanely excited about a seasonal recipe, I can’t hold it back. Even though I work a little ahead on the blog, I can’t ever hold back the ones that make me freak out. This is lose-your-mind sauce right here people. If you are a squash-loving fool like I am, you’re in for a huge treat. Even if I feel like I’m playing a huge trick on us all because it’s still in the 80s here! Like what.the.heck. This is like a giant hug simmering in a pot. Not that we want a giant hug when it’s 86 degrees out but YOU KNOW. It’s comforting. It’s satisfying. It can be used in so many ways: as a traditional pasta sauce, as a sauce on zoodles, as a base for mini pita pizzas – so many things. You could even throw it on top of some butternut noodles for squash inception. And it tastes like heaven. Pure, absolute heaven. It begins with caramelized onions. I mean – the biggest flavor builder of them all! After that, some butternut squash cubes. A little bit of pumpkin. Fire roasted tomatoes because we all know how obsessed I am. Sage, some allspice and a touch of cream. Parmesan of course. For years (like, years! Longer than I’ve been blogging?) 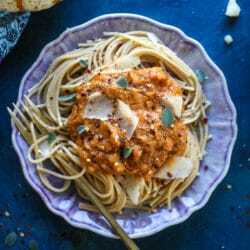 I was obsessed with the fall pasta sauce from Williams Sonoma. I used to buy it every year (along with the pumpkin pancake mix!) and it was one of the things that got me excited for the season. I still buy the pancake mix because I just can’t quit it. And then Trader Joe’s put out a version of the sauce (that you can serve with those adorable little pasta pumpkins!) and I was like I HAVE TO MAKE THAT. Caramelize the onions, get the squash a bit caramely too and then go ahead and simmer that deliciousness. Since I’m a texture person, I knew that I wanted a little texture but not, say, huge chunks of squash. You know? First, I mashed some of the squash chunks that were left. Just a quick, coarse mash. Then I transferred half of the sauce to the blender and pureed it until smooth. I stirred it back into what was left and it created the best consistency of sauce EVER. For me, this was the key to the sauce! I would say it’s a squash-like marinara. It is hearty, but not in a meaty type of way. You could try adding some mushrooms if you’d like, but I think they might change the flavor too much. If you go into your squash sauce experience viewing it like a marinara, you will love it. Especially if you pair it with a nice glass of red. This is exactly what I want to eat in October. 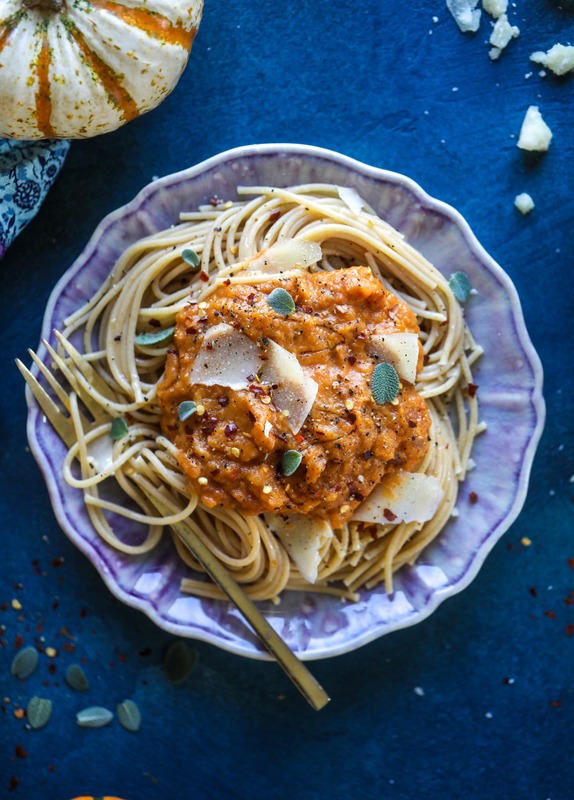 This butternut squash pasta sauce is heaven for an October dinner! Fire roasted tomatoes, butternut squash, pumpkin, sage, spice and parmesan all come together to create a delicious, simmered pot of sauce to blanket your favorite pasta! Heat a large pot over low heat and add the olive oil and butter. Once melted, stir in the onion, salt and pepper. Cook, stirring often, for 20 to 30 minutes, until the onion is caramelized. Stir in the garlic, squash and fresh sage. Cook, stirring often, until squash begins to soften and almost caramelize, 10 to 12 minutes. Stir in the tomato paste and cook for 5 minutes more. Add in the diced tomatoes, chicken stock, pumpkin puree, allspice and nutmeg. Bring the mixture to a simmer. Cover and let it simmer for 30 minutes. Add in the cream, stir, and simmer for 15 minutes more. At this time, you can either use an immersion blender to puree a bit of the sauce - or you can transfer half of the mixture to a blender and puree until smooth before adding it back to the pot. Once the sauce is half blender, stir in the parmesan cheese. Cook for 10 to 15 minutes longer. Taste the sauce and season it additionally if needed with salt and pepper. Serve over your favorite pasta! Yeah, this weather is beyond absurd. Hooray for autumn weather (hopefully coming soon) and this amazing pasta sauce/dish. Omg, this is everything I want right now! Can’t wait to make it! Haha I wish that the weather would catch up to my fall cravings already. This is the best combination of squash mac and cheese and this pumpkin pasta from Rachael Ray I used to make. Love it! What kind of dinnerware are you serving this on? Gorgeous!! Can’t wait to try this tomorrow. i loooove that recipe too. thanks CJ!! Saw this posted yesterday morning and decided to forego my original dinner plans and make this last night. Soooo tasty! This sounds so cozy! I cannot wait to try it out! Yep, making this ASAP! I love pumpkin mac and ‘cheese’ and adding a sweet potato to marinara, but I’ve never actually seen TJ’s squash sauce! What rock have I been living under?! sweet potato in marinara?! that sounds amazing. This is delicious! I may have eaten it straight out of the pot without pasta! Tonight i will have it over spaghetti squash! Yummm I’ve been thinking about making something like this since I have so much squash from my CSA…. this recipe looks great! Have you tried it with any other squash varieties? Right now I only have a little butternut, but tons of acorn! When did you add the ground turkey? My husband must have meat! TIA. Hi Melissa! I browned the turkey in a little butter and olive oil in a separate pan during the sauce’s 30 min covered simmer. Then I added the turkey in with the cream! (Though for the batches I froze, I added the turkey without the dairy and froze the sauce at that stage, since I figured it would freeze and thaw better if I waited to add the cream and parmesan while the sauce is reheating, right before serving.) But if, unlike me, you use a blender for the sauce, I would wait to add the turkey until after blending and let it simmer in with the parmesan. Hope this works for you as well as it did for me! This sauce is so delicious! I cannot wait to make it again and again and again! Thanks! Do you drain the diced tomatoes or use the liquid? This is my first How Sweet Eats recipe and it came out pretty good I think! I added some goat cheese to it when I realized I didn’t have any parm! Tasted delish! This sauce. THIS SAUCE. It was absolute perfection in every way. I used frozen butternut squash cubes which worked very well, to my delight (cubing a squash is not my favorite thing). I’ll be using the rest of the bag to make a second batch for freezing. You are a genius Jessica! This sauce qas one of the best autumn dishes I’ve tried. Thanks for the recipe. I made this sauce this week, and it was fantastic. I see this having a place in our regular dinner rotation throughout the fall/winter! Could you sub milk for the heavy cream?! My husband is lactose intolerant so I can only use lactose free stuff and so far all I have found is whole milk and sometimes half and half. HELP! this looks so good…as does the pizza! Maybe a late response but I’m lactose intolerant and I always use canned (full-fat) coconut milk in place of heavy cream in recipes & it always works for me! I can never find the fire-roasted tomatoes at my store, womp womp. 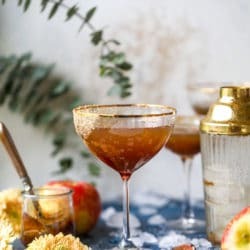 I made this and found that it needed just a little oomph of something- a squeeze of fresh lemon juice at the end was just the trick. Very tasty!